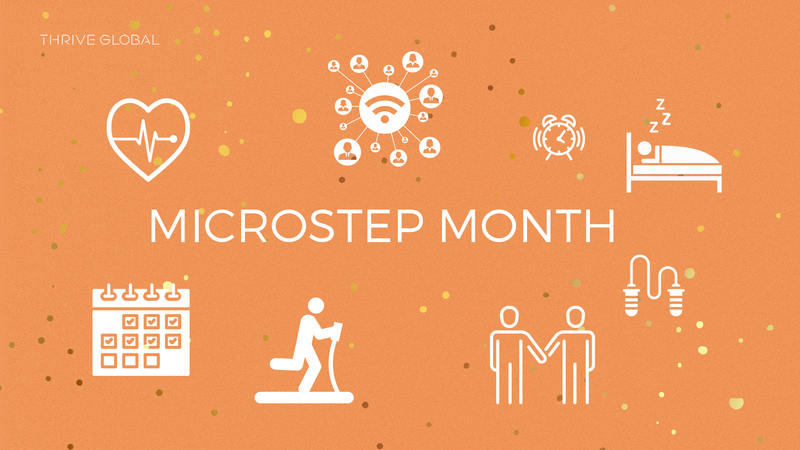 This January, Thrive is celebrating Microstep Month. Instead of setting overly ambitious New Year’s resolutions that make you feel bad when you can’t accomplish them, we want to help you revolutionize your approach to resolutions with Microsteps, Thrive’s science-backed, too-small-to-fail mini habits that you can easily integrate into your life right away. Research shows that nearly half of New Year’s resolutions fizzle before February. To make sure that doesn’t happen to you, we invite you to join us this month in selecting an easily achievable (totally free!) Microstep that is proven to help you meaningfully form new habits. We challenged Thrive staffers to test a Microstep for 32 days and write about their progress. The result? Some very honest and encouraging Microstep Diaries, like this one. Watch what happens when Katie tries to put her phone away every night for 32 days. Microstep: Schedule a time each night to put your phone in “Do Not Disturb” mode. I oftentimes find myself not being able to fall asleep. I’m also usually mindlessly scrolling social media. It’s unnecessary, and I think the mindless scrolling goes hand in hand with not being able to sleep. At the end of this experiment I hope to be able to fall asleep easily and not feel the need to check my phone updates before bed. Aside from a night out with friends, I stuck to my challenge really consistently. I would put my phone on airplane mode 30 minutes before bed, read, become tired, shut the light off, and easily fall asleep. I also noticed myself waking up before my alarm oftentimes. The days I was successful, I felt a higher amount of energy throughout the day. I noticed when I was talking about it to co-workers, friends and family, I felt more inclined to stick to it because I knew people were going to ask me about it and follow up. Once I stopped talking about it, and it got somewhat normal, I slid back into my old ways of playing on my phone before falling asleep. I was frustrated by this behavior and also had trouble falling asleep. But when I stuck to the challenge, I felt accomplished and overall happy. Unfortunately, because I did not stick with the challenge the second part of the 32 days, I don’t feel like I formed a habit. Reflecting on this makes me want to try again, but this time, to place my phone in an area that’s hard to get to from my bed (like outside the room or across the room) to make it easier for me to stick to disconnecting before going to sleep. I think the microstep challenge is a great way to jumpstart forming a habit that can truly make your life better. I felt really great when I completed the step daily. I would recommend thinking about how to make your step as simple as possible to stick to. The temptations of social media before bed are strong, especially when the phone is so close to the bed. I am definitely going to continue on with this challenge past my 32 days and re-up with a modified plan of putting my phone out of reach. I’m not giving up my goal of forming a habit. Katie is the first recruiter to join Thrive Global. She comes with 3 years of technology recruiting experience from TEKsystems, where she placed technical, creative, and product professionals at startups around the city. In addition to her passion for recruitment and people development, she loves participating in NYC tech meetups, exploring cities around the world, and spending time with her dogs @blue_and_kody.